I have started fiddling with gideros and arabic again. Let me explain: I have an arabic word with vowels! I transform it to numbers depending on the letter, then I transform the vowel to a string. Then I map those to a .png and show it to the screen. That's it. I need to work on position and more stuff, but that should do it for my needs. PS: the older answers do not work in some cases, so I had to do it from scratch. PS2: i won't be here for the next two weeks! Could you tell me if the class can be better written please? The code is a bit long because it accepts 15 letters and I like when the code is not in one block. You can put spaces to make a sentence. I'm also interested in how to work with arabic symbols, thx for your information! Yes, I have tried that too with other fonts but some letters weren't attached properly. I believe there is some code left in the repo that shows that. Plus I added vowels! will work more on this when coming back then I'll post the whole thing insha'Allah. I am using the following piece of code to preprocess arabic before sending to TextField. It seems to be ok according to the few arabic customers I have, but I don't read arabic myself so can't tell for sure. I'd like to integrate it into gideros, so I'd be glad if some arabic speaker/writer could check it up! @MoKaLux Does @hgy29 's latest arabicProcessing (above) function have the vowel changes you made? If not, could you add them and repost it here? Hi guys I dont have a computer here. @hgy29 before doing my code i tried yours but some letters were not connected properly. 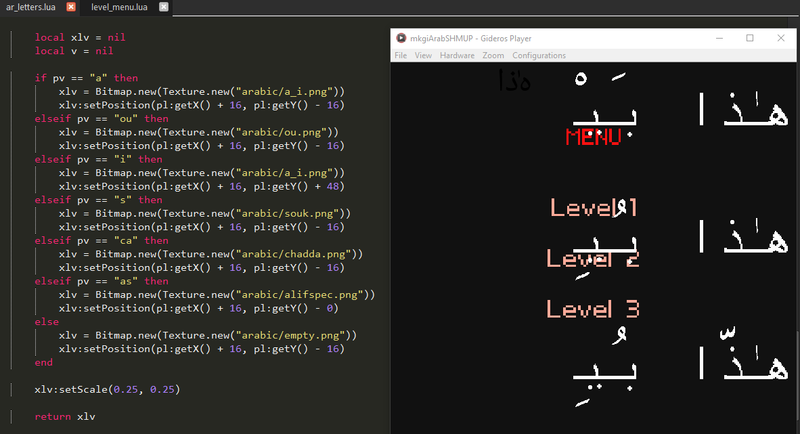 let's begin: in your code you have 0x... for arabic letters I suppose in what format? html? this allow us to deal with vowels as well. 'this is in fact unicode. It's kinda hidden from you. 'Write our string back to the cell. See attached my excel experiment. I don't think my solution is the answer to dealing with arabic in gideros, but it works for my projects. The function is not complete yet because I wanted to give it a try before leaving. So the way I do it is via a texture pack of all the letters isolated, beginning, middle and end of words. Then I add some more graphics for the vowels and voilà. Hope that will help you guys. You give us so much you need some payback. In the meantime I am going to have a look at your code again to see what I understand from it (but it's hard because you put too few comments ). Could you just tell me what are those 0x... symbols? @hgy29 one thing I can do is to use your class and tell you where it fails. Plus for the vowels we need to have a code for them as well. For example letter N + vowel A = 16061614 in unicode. Digging and reading further I understood a few things: arabic vowels glyphs are classified as 'combining diacritics' that should just be drawn above the preceding character. This should already work in theory provided that unicode chars are reversed before sending them to text field, assuming that those 'combining' characters don't take space by themselves. Hours later: diacritics are misplaced because freetype doesn't handle opentype GPOS tables, which indicates how to lay out composed glyphs. Freetype guys suggest to use HarfBuzz library instead for complex script rendering. Benefit: it would handle vietnamese, thai, khmer, etc too, not just arabic. Drawback: I am afraid it would enlarge gideros codebase significantly. The conversation is interesting because they speak of licences too. The code is C++. This piece of code looks great. I will have to test it! The only issue here is that users will have to translate their text to unicode and then use your code. Or am i missing the point and you try to implement harfbuzz to do this for us? I had a look at ICU and it seems to do the same thing as harbuzz? Personally, your code should be all I need for all of my project where I pass in the unicode to show some arabic text. 1. Get a string with the text we want to display: lua strings are only 8 bit, so in gideros texts are expected to be UTF8 encoded. This is what the editor do automatically, but this cause trouble with RTL texts such as arabic, so I used utf8.char() to encode the two codepoints 1606 and 1614 into UTF8 by code for better readability. 2. text is separated into RTL and LTR chunks. This is a process known as BiDi algorithm. As part of this process RTL texts are reversed to displayed LTR by drawing engine. Gideros doesn't do that step at all and just assume texts are always LTR. 4. Glyphs are 'shaped': glyphs are laid out relative to each other depending on language rules. Gideros doesn't do that either, again it assumes latin rules. This is what HarfBuzz is doing. 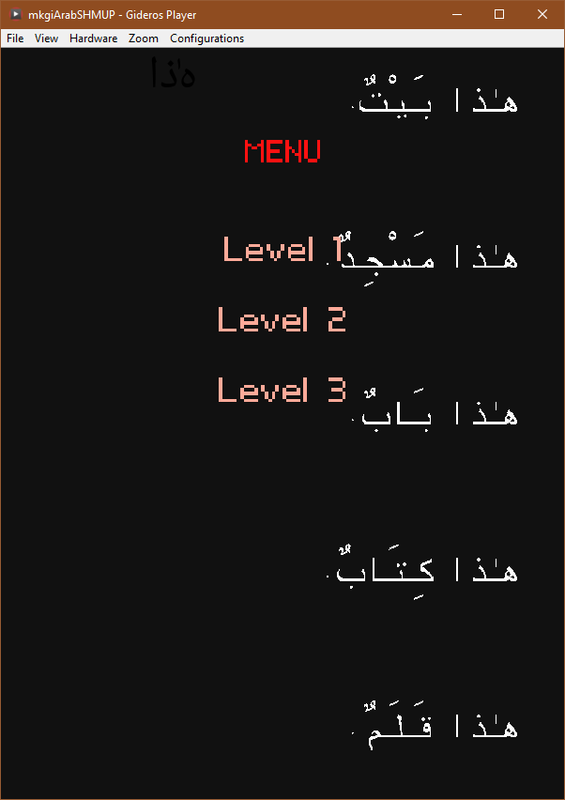 My code above was doing step 2 for arabic, and probably not accurately, but even with that, step 4 was missing too. ICU used to do the same as HarfBuzz plus BiDi. They have dropped there shaping routines and integrated HarfBuzz instead, but ICU seems to be much more than just a text layout engine. thank you @hgy29 . I understand your points. When I am back I will try an example with your code and show you how I would use it. How much does HarfBuzz increase the size by? Will it be needed only for Arabic text? Will BiDi be added to the normal text system too? If so, will the existing ArabicProcessing function still work? HarfBuzz .dll is around 1MB in size, which is quite a lot compared to other plugins. I can't tell for other platforms yet. It actually handle most languages, not just arabic. I am not sure how I will implement BiDi yet, but I'll make it optional. I am looking for a lightweight implementation. So far I found ICU and FriBiDi, but I could make my own for trivial cases too. Using HarfBuzz and BiDi will make arabicProcessing obsolete, but since it will be a plugin there shouldn't be much concerns about backward compatibility.